This page outlines the simplest care instructions, for more detail on each subject use the menu links above. The #1 thing to avoid is overwatering. Violets like moist, but not soggy soil. After watering drain off any excess after 30 minutes, and never let them stand in water. This will harm the roots. Water Temp: Never water with cold water, room-temperature is perfect. Many plants, including African Violets are sensitive to Chlorine. Let tap water sit open for 2 hrs. to evaporate. Water from below to avoid getting cold liquid on the leaves, as this can cause spotting damage. Never use soft water. Never Place In Direct Sun. Always indirect or filtered sunlight. A popular spot is on a windowsill or table near a bright window. North/NW/NE exposure is best. Artificial light works well for Optimara Violets and no special equipment is needed. 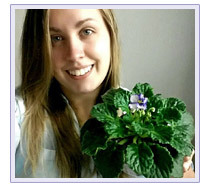 Two CFL bulbs(1500 lumen, $8) , plus 2 normal desk-lamps can grow 4 to 6 gorgeous violets on a table. African Violets enjoy about the same temperatures as humans between 60 and 87F. Humidity is also an important factor in blooming, Violets thrive at 40% to 60% humidity. You can increase the ambient moisture around the plants by grouping them together. During winter air may be especially dry inside. Placing a tray or two of water and pebbles by the plants is usually enough to raise the humidity. 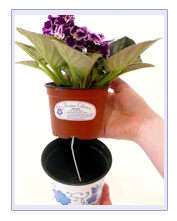 Always use African Violet potting soil, available at most garden centers. Violets thrive in light, porous and spongy soil, which allows the roots to grow freely. The pH levels in soil may change over time, causing less flowering, pH level of 5.8 to 6.2 is ideal. 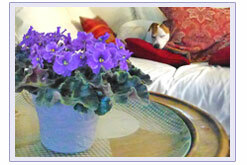 POTTING - Re-pot your African Violet in fresh AV soil once a year for correct soil pH, super-health and vitality! 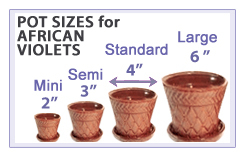 African Violets are grouped as 2" mini, 3" semi-mini, 4" standard and 6" large. Keep in roughly the same size pot, maybe moving up 1 or 2 inches for a large plant. Too much soil just holds in extra water which can go sour. Violets like the fill the pot with roots & bloom best that way. If your African Violet has not flowered in more than 5 weeks then it needs some change of conditions. 1) Try more light or if they don’t bloom in winter due to lighting changes then place under a lamp. 2) Consistent watering, if the plant gets very dry frequently it will probably stop flowering. 3) Side-growths or “sucker” plants. New crowns forming on the sides and baby plants emerging will drain the energy used for blooming. Remove them for best blooms. 4) Too Low humidity. If it is below 40% then the buds will form but will dry up before opening. Thrips: A commmon pest that feeds on pollen. They prefer dark our purple violets. If you see spilled pollen on your blooms then disbud (remove all blooms and buds) for 3 to 4 weeks on all your violets. When they re-bloom the thips should be gone. If they re-appear frequently you may want to use a commercial spray to control them. Gnats can spread fungus and disease to flowers and roots. If they buzz your violets then find their source, or use a comon remedy like apple-cider vinegar with soap to attract/trap them. THE #1 TIP - Major cause of root-rot is overwatering. If your plant has become bone-dry, then only add enough water to moisten the soil. The roots have probably dried up and can’t absorb water at the usual rate. Water sparingly for 1 week while they recover.